You must be a member of the Istanbul Russian Culture Group to attend this activity. Would you like to join this group? Free admissions. Drop in, no reservations. Presented as part of Parajanov, with Sarkis exhibition, Pera Film’s Rebel Images: Sergey Parajanov is a collection of the director’s films given form by his unbridled imagination and documentaries that showcase the testimonies of artists who have been inspired by Parajanov’s work. Named a “genius”, a “master”, and a “magician” by Tarkovsky, Godard, Fellini, Antonioni and other renowned directors of the history of cinema, Sergey Parajanov, after his incarceration in Protected content his dissident views and sexual orientation, revealed the unconstrainable nature of images with his art that reached beyond walls, proving once again his mastery of poetical cinema. One of the greatest masterpieces of the 20th century, The Color of Pomegranates a biography of the Armenian troubadour Sayat Nova (King of Song) reveals the poet’s life more through his poetry than a conventional narration of important events in Sayat Nova’s life. We see the poet grow up, fall in love, enter a monastery and die, but these incidents are depicted in the context of what are images from Parajanov’s imagination and Sayat Nova’s poems, poems that are seen and rarely heard. 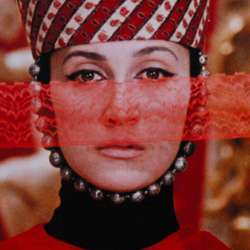 Sofiko Chiaureli plays 6 roles, both male and female, and Sergey Parajanov writes, directs, edits, choreographs, works on costumes, design and decor and virtually every aspect of this revolutionary work void of any dialog or camera movement. We will meet at Protected content designed as an “art deco” café in reference to the “Bristol Hotel” - built in Protected content , serving until the Protected content . (The menu includes a wide range of offerings; from salads, sandwiches, special pastas to high-quality pastries.) After the gathering, we will have roughly one hour time to visit Parajanov with Sarkis exhibition at Pera Museum. Exhibition is free today and will be open until 22:00. We may start the tour around 20:00. The exhibition has been prepared in collaboration with the Sergey Parajanov Museum, and features works exclusively created in homage to Parajanov by Sarkis, another master artist who passionately followed him. This selection that brings together all periods of the versatile, multicultural visual world of renowned director Sergey Parajanov. Featuring many works across a wide spectrum ranging in style from the traditional to pop-art, from strikingly unique collages to storyboard drafts, from film costumes to drawings, paintings, mosaics, objects and photographs, the exhibition sheds light on the brilliant and fertile world of the artist.